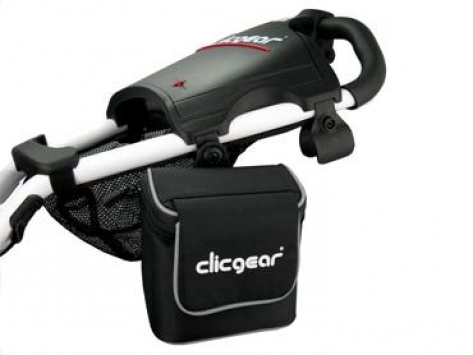 The Clicgear® Rangefinder / Valuables Bag is great for on course storage of your rangefinder or other valuables. Made from waterproof nylon, it is insulated and lined with soft material to keep your device safe. Has zipper and magnet flap closure for quick access. Approximate interior dimensions are 6″ Tall x 5″ Wide x 3″ Deep. This accessory fits all Clicgear Model 1.0, Model 2.0, Model 3.0, Model 3.5 Plus and Rovic® Carts. It will also fit other brand name push carts with 1″ tubing. This product is supplied with (x1) Clicgear Accessory Tab mounts for easy installation.